The protest movements of the Arab Spring prompted a major reevaluation amongst policymakers and academics alike about authoritarian regime stability in the Middle East. Counter to the euphoria that greeted the protests, continued instability and extreme violence in several Middle Eastern states has sparked concerns that the dictators who ruled before may have been better of two bad options. These concerns obscure from the significant political transformation that Tunisia has undergone, from one of the most repressive dictatorships in the region to its sole genuine democracy. While Tunisia’s successful democratic transition looks like an anomaly in its current regional environment, Egypt did achieve a significant historic milestone when it elected President Morsi in free and fair elections. His tenure did not last long, and Egypt’s broader failure to democratize prompts questions as to how democratic transitions succeed after dictatorships. New political actors and certain ancien régime institutions played critical roles in ousting the dictators, but the timeline of whether democratic elections took place before or after new constitutions were adopted was paramount in determining the success of the democratic transition because it structured whether the country’s political design would be determined by dialogue and deliberation or on the fly by the political actor with the greatest popularity. Instead the Muslim Brotherhood, the salafists, and other Islamists threw their considerable financial and organizational weight behind the constitutional amendments and the restoration of much of the 1971 constitution until the constituent assembly was formed. This decision reflected purely partisan interests and not a deliberative attitude towards democracy. It also polarized the political spectrum, angering the liberals because two of their top presidential candidates were barred under the new selection criteria, and broke the nascent ties between the Islamists and the liberals that had developed in the revolution. 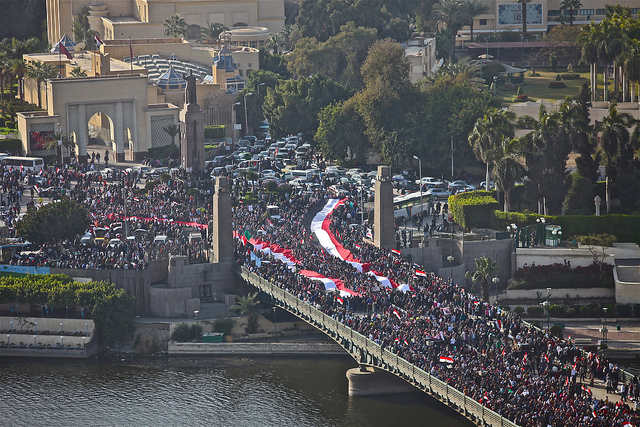 From this moment on, the liberals and the Islamists found themselves in a bitter political conflict over the spoils of the revolution, a conflict further enflamed by Morsi’s heavy-handed tactics upon assuming the presidency and which ended only with his ouster. This conflict was predetermined by the failure of the revolutionary movement to establish a consensus for a new constitutional system before the election of a president. Utilizing the existing constitutional framework left authoritarian levels of power in the hands of the executive and in such a setting, it is unimaginable how a constitution based on consultation and dialogue could have been written, given extreme imbalance in power between the Islamists and the liberals. The Egyptian case demonstrates that handing the keys of an authoritarian state to another man by an election does not yield democracy. Rather, it is absolutely indispensable that power sharing structures be established before elections can ever take place. By contrast, the constitutional process allows revolutionary actors of different strands to build trust and make concessions via dialogue and time, despite ideological disagreements over the structure of the future state and political crises. Not unlike the military in the Egyptian case, the vestiges of Ben Ali’s regime attempted to commandeer the revolution and reassert their privileges. Unlike the Egyptian case however, the secularists and Islamists remained united, participating jointly in demonstrations at the Casbah plaza to demand the ouster of interim Prime Minister Mohamed Ghannouchi, who not to be confused with the Ennahda’s Rachid Ghannouchi, was a holdover from Ben Ali’s ruling party, the Constitutional Democratic Rally (RCD). 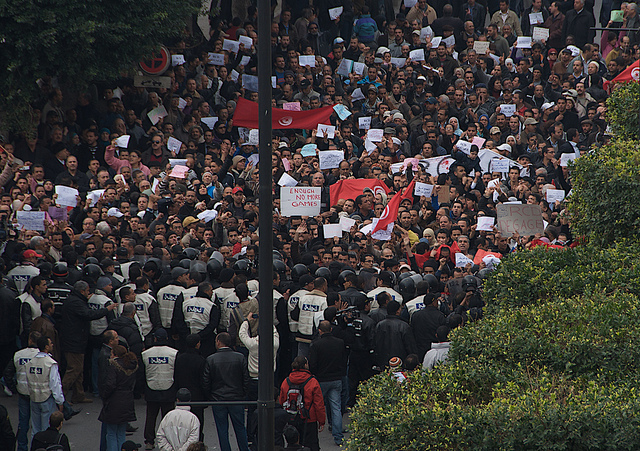 This demonstration ensured the “dissolution of the RCD…[the] legalization of Ennahda, and that elections for the Constituent Assembly would be held.” The Casbah protests illustrate how the Tunisian revolutionaries’ were able to achieve concrete political objectives by remaining united against the vestigial regime forces attempting to break them up. Soon thereafter, the Islamist Ennahda party won the country’s first free and fair election, sparking concerns that it would seek the spoils of political power just as the Muslim Brotherhood did in Egypt. Instead of confirming those fears, the Ennahda established a governing coalition in the Constituent Assembly and divided up leadership roles with the heads of the CPR and the Ettakatol, a power-sharing arrangement which was dubbed the Troika. Despite the continued potential for political opportunism by the Ennahda, the party approached politics in a consultative manner, not letting divisive issues jeopardize the continuation of the talks. In an act of magnanimity, the Ennahda made a decisive concession to the secularists with its announcement in March 2012 that the party would not insist on making sharia a or the source of legislation. Shortly after the counterrevolution in Egypt, though, leftist Tunisian MP Mohamed Brahmi was assassinated, which sparked a week-long protest that called for the end of the coalition government. Parallel to Egypt’s transition, politically charged violence threatened the entire democratic enterprise, but thanks to dialogue between the leaders of the opposition and the Ennahda, a compromise solution was reached and the Constituent Assembly was able to resume and then complete its work. The Tunisian Constitution contains numerous contradictions that will be open to interpretation and contestation in the years to come. 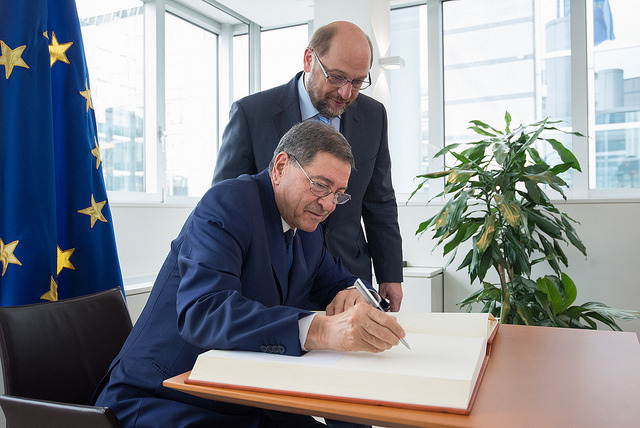 However, it is also a reflection of the emerging consensus between Ennahda and the secularists and the product of major concessions made by the Ennahda on the protection women’s rights and the freedom of speech and religion. 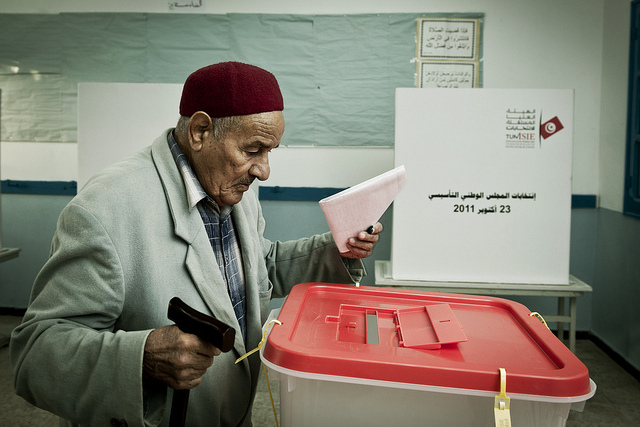 By rejecting continuity with the authoritarian regime’s institutions in favor of redesigning government, Tunisia’s revolutionary forces averted the polarizing effects of presidential elections and created a constitutional structure viewed as legitimate by both sides of the political spectrum. The legitimacy of this structure was tested by the 2014 presidential elections, in which the Ennahda party candidate Moncef Marzouki portrayed opponent Essebsi’s potential presidency as a reversal of the “Jasmine Revolution.” However after the election results confirmed Essebsi’s victory, Marzouki quickly conceded defeat, thus signaling that the Ennahda was accepting a transfer of power to the hands of the Nidaa Tounes and would not seek power outside of democratic means. Democratic transitions occur in the aftermath of revolutions when the major political actors view democracy as the best form of governance for realizing their political objectives. However this is not enough to sustain democracy. A conception of democracy based on deliberation, constitutionalism, human rights, and an independent judiciary, refines an understanding of what sustains and jeopardizes democracy, an important clarification when the very definition of democracy is a point of contention amongst competing political actors. While the military ended Egypt’s democratic experiment and the UGTT framed the objective of Tunisia’s revolution as democratic, the interests of these institutions did not predetermine the outcomes of the transitionary period. Instead, the chronology in which presidential elections and the adoption of a constitution occur contributed greatly to the degree of polarization in the populace. This in turn affects whether political actors are willing to turn to extant institutions to facilitate a regime change away from the democratically elected administration. Egypt’s failed transition to democracy illustrates how the presidential elections without constitutional reforms first taking place polarized the electorate and drove many Egyptians who had previously called for a removal of the military from a supervisory role, to cultivate its support in toppling the newly elected president. On the other hand, Tunisian political actors made important concessions and overcame political crises during the transition period to develop a consensus and hold presidential elections because the constitutional process was deliberative and inclusive. Michael Albertus and Victor Menaldo, “Aftermath of Revolution,” The New York Times, February 14, 2013. Ibrahim Awad, “Breaking out of Authoritarianism: 18 Months of Political Transition in Egypt,” Constellations 20, no. 2 (June 1, 2013), 282. Erica Chenoweth and Maria J. Stephan, Why Civil Resistance Works: The Strategic Logic of Nonviolent Conflict, Columbia University Press, 2011, 11. Shadi Hamid, “ The Prize,” from Kenneth M. Pollack ed., The Arab Awakening: America and the Transformation of the Middle East, Brookings Institution Press, 2011, 105. Nathan J. Brown, “Egypt’s Failed Transition,” Journal of Democracy 24, no. 4 (2013): 50. Steve Coll, “The Casbah Coalition,” The New Yorker, April 4, 2011.
International Crisis Group, “The Tunisian Exception: Success and Limits of Consensus,” June 5, 2014. Michele Penner Angrist, “Understanding the Success of Mass Civic Protest in Tunisia,” The Middle East Journal 67, no. 4 (2013):, 562. Sarah Mersch, “Tunisia’s Compromise Constitution,” Carnegie Endowment for International Peace. Patrick Markey and Tarek Amara, “Veteran Essebsi Wins Tunisia’s First Free Presidential Vote,” Reuters, December 22, 2014.